Welcome to Alaska's Capitol! Originally completed in 1931, the building served as the territorial Capitol housing the Legislature, Governor, the post office, Courts, and numerous other federal and territorial agencies. Today our Capitol contains the offices of the State Legislature, Governor, and Lieutenant Governor. When the Legislature is in Session (mid-January through mid-April), the Capitol is open to the public 7:00a.m.-9:00p.m., seven days a week. During the Interim, when the Legislature is not in Session, the Capitol is open to the public 7:00a.m.-5:00p.m., Monday-Friday and closed Saturday and Sunday. Capitol Tour & History Full Video (40.5 MB File) Download to your desktop and play with Windows Media Player. Capitol Tour & History Short Video (18.8 MB File) Download to your desktop and play with Windows Media Player. Congress authorized and made an initial appropriation for the building in 1911, but construction did not begin until 1929. There were many reasons for the delay, including the cessation of all public works of this type caused by World War I. One early delay was the refusal of the federal government to pay the owners' asking price for some of the lots on the site. This was overcome by local citizens and businesses who contributed money to purchase the necessary lots and deed them to the government. Architects in the U.S. Treasury Department prepared plans for the building, and the construction contract was awarded to N.P. Severin Company of Chicago. Ground was broken by territorial governor George A. Parks on September 18, 1929. Construction is brick faced reinforced concrete. The lower facade is faced with limestone. The limestone and marble used in the four columns of the portico and in the lobby were quarried on Prince of Wales Island in southeast Alaska. In front of the building is a replica of the Liberty Bell, given to Alaska in 1950. A similar bell was given to every state as part of a promotional campaign for U.S. Savings Bonds. 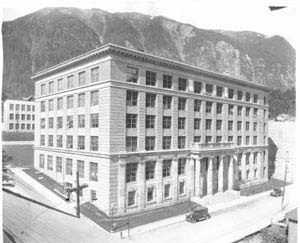 Awaiting construction of the capitol, the territorial legislature, beginning with its first session in 1913, met in rented buildings around Juneau. The territorial governor was also in rented quarters when the capitol opened in 1931. When Alaska became a state in 1959, the building became the property of the state under provisions of the Alaska Statehood Act. In the lobby are two clay fired sculptures by Joan Bugbee Jackson. The scenes "Harvest of the Sea" and "Harvest of the Land" depict hunting and fishing in the 1930's and took approximately nine months to complete. Other carvings depict principal sources of income for the state: oil and gas, fishing and fish processing, wood products, minerals, tourism, hunting and trapping. Also on the ground floor is the documents office, which distributes bills and other official publications during the legislative session. The remainder of the ground floor consists of legislators' offices and meeting rooms, as does the first floor. The legislative chambers have always been on the second floor, although not exactly where they are now. The original Senate chambers were in the rooms currently used as offices for the House Speaker and majority caucus. These rooms were restored in 1979. Much of the furniture is from the territorial period, and the hand stenciled ceiling dates from the time of construction. The entire third floor is occupied by the governor and lieutenant governor. In the main hall is the "Hall of Governors" containing pictures of all territorial and state governors. Until 1993 the fourth floor housed the Attorney General's offices. Today the entire fourth floor is used by the Legislature for offices and meeting rooms. The Senate Finance Committee room is located on the fifth floor in what was once the federal district court room. This room has also been restored and the wooden benches are those that were used in the original court room. Alaska's Capitol has served as the symbol and seat of government for over 60 years, and continues today to be a working Capitol.